Zephyr Pozidriv Insert Bits are heat treated in small lots to guarantee consistent quality. Zephyr's unique Z-Forge process assures an exact dimensional fit in the recess. 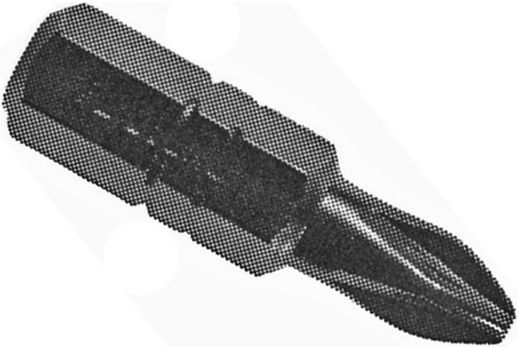 Zephyr Screwdriver Bits will give you the truest fit, longest performance and the least cam-out and product damage of any available screwdriver bit at any price. Zephyr Pozidriv Insert Bits have served the aerospace and automotive industries with high quality, technically innovative tools produced in a manufacturing environment that features intense quality control and superior customer service. #1 Pozidriv Zephyr insert bit, 1/4'' hex shank, aircraft intermediate hardness, 1'' overall length. #1 Pozidriv, ACR 4x4, Zephyr insert bit, 1/4'' hex shank, industrial extra hard, 1'' overall length. #1 Pozidriv Zephyr insert bit, 5/16'' hex shank, aircraft intermediate hardness, 1-1/4'' overall length. #1 Pozidriv Zephyr insert bit, 1/4'' hex shank, industrial extra hard, 1'' overall length. #2 Pozidriv, ACR 4x4, Zephyr insert bit, 1/4'' hex shank, industrial extra hard, 1'' overall length. #1 Pozidriv Zephyr insert bit, 5/16'' hex shank, industrial extra hard, 1-1/4'' overall length. #2 Pozidriv Zephyr insert bit, 1/4'' hex shank, aircraft intermediate hardness, 1'' overall length. #3 Pozidriv, ACR 4x4, Zephyr insert bit, 1/4'' hex shank, industrial extra hard, 1'' overall length. #2 Pozidriv Zephyr insert bit, 5/16'' hex shank, aircraft intermediate hardness, 1-1/4'' overall length. #2 Pozidriv Zephyr insert bit, 1/4'' hex shank, industrial extra hard, 1'' overall length. #2 Pozidriv Zephyr insert bit, 5/16'' hex shank, industrial extra hard, 1-1/4'' overall length. #2 Pozidriv Zephyr insert bit, 1/4'' hex shank, aircraft intermediate hardness, 1-1/2'' overall length. #3 Pozidriv Zephyr insert bit, 5/16'' hex shank, aircraft intermediate hardness, 1-1/4'' overall length. #2 Pozidriv Zephyr insert bit, 1/4'' hex shank, industrial extra hard, 1-1/2'' overall length. #3 Pozidriv Zephyr insert bit, 5/16'' hex shank, industrial extra hard, 1-1/4'' overall length. #4 Pozidriv Zephyr insert bit, 5/16'' hex shank, aircraft intermediate hardness, 1-1/4'' overall length. #2 Pozidriv Zephyr insert bit, 1/4'' hex shank, industrial extra hard, 2'' overall length. #4 Pozidriv Zephyr insert bit, 5/16'' hex shank, industrial extra hard, 1-1/4'' overall length. #2 Pozidriv Zephyr insert bit, 1/4'' hex shank, aircraft intermediate hardness, 2-1/2'' overall length. #2 Pozidriv Zephyr insert bit, 1/4'' hex shank, industrial extra hard, 2-1/2'' overall length. #3 Pozidriv Zephyr insert bit, 1/4'' hex shank, aircraft intermediate hardness, 1'' overall length. #3 Pozidriv Zephyr insert bit, 1/4'' hex shank, industrial extra hard, 1'' overall length. #2 Pozidriv Zephyr insert bit, 1/4'' hex shank, reduced nose diameter, aircraft intermediate hardness, 1'' overall length. #2 Pozidriv Zephyr insert bit, 1/4'' hex shank, reduced nose diameter, industrial extra hard, 1'' overall length. #1 Pozidriv Zephyr insert bit, 1/4'' hex shank, reduced nose diameter, aircraft intermediate hardness, 1'' overall length. #1 Pozidriv Zephyr insert bit, 1/4'' hex shank, reduced nose diameter, industrial extra hard, 1'' overall length.